The President's Daily Briefing is the top-secret intelligence report the CIA presents to the president every weekday. The book shown here is for a briefing delivered to President George W. Bush in 2002. 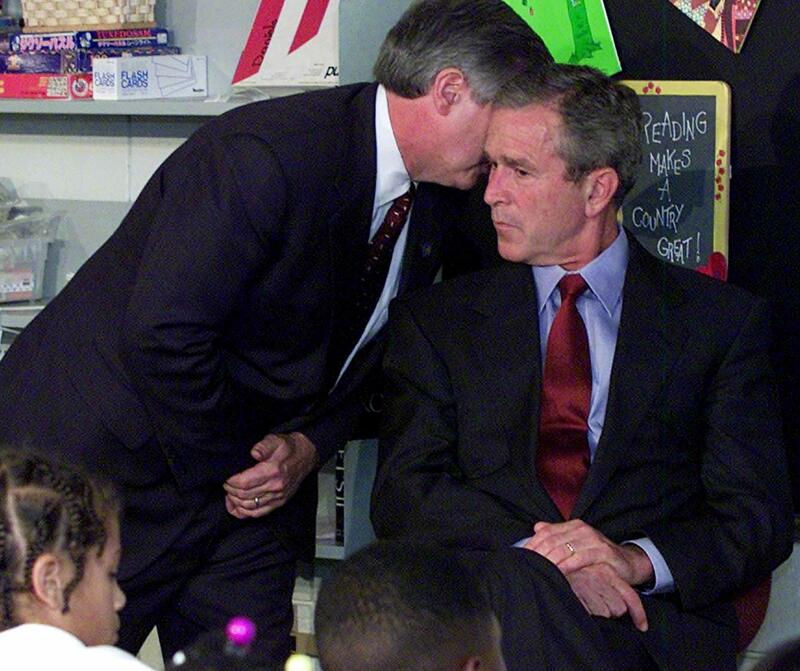 Chief of Staff Andy Card whispers into the ear of President George W. Bush to give him word of the planes that slammed into the World Trade Center in New York, on Sept. 11, 2001. Bush had received his daily intelligence briefing shortly before and had just begun a visit to the Emma E. Booker Elementary School in Sarasota, Fla. 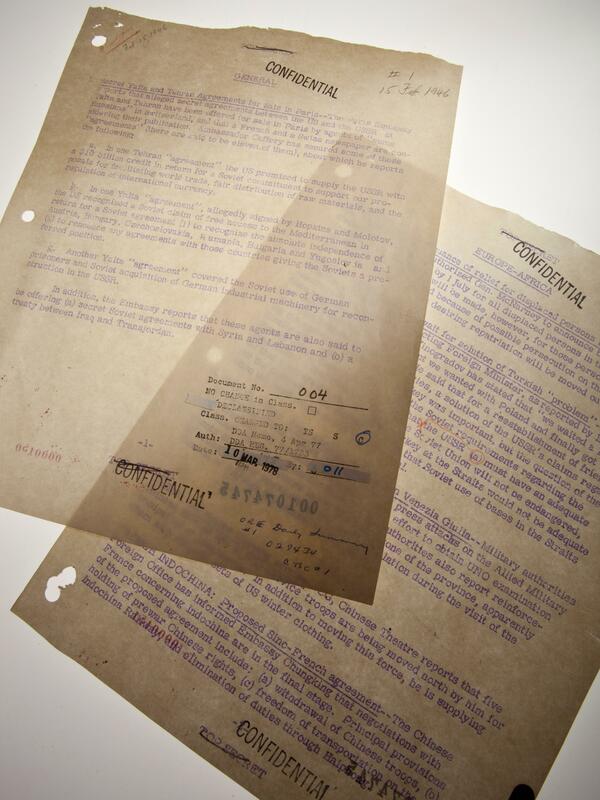 This image provided by the Central Intelligence Agency shows the first Daily Summary delivered to President Harry Truman on Feb. 15, 1946. 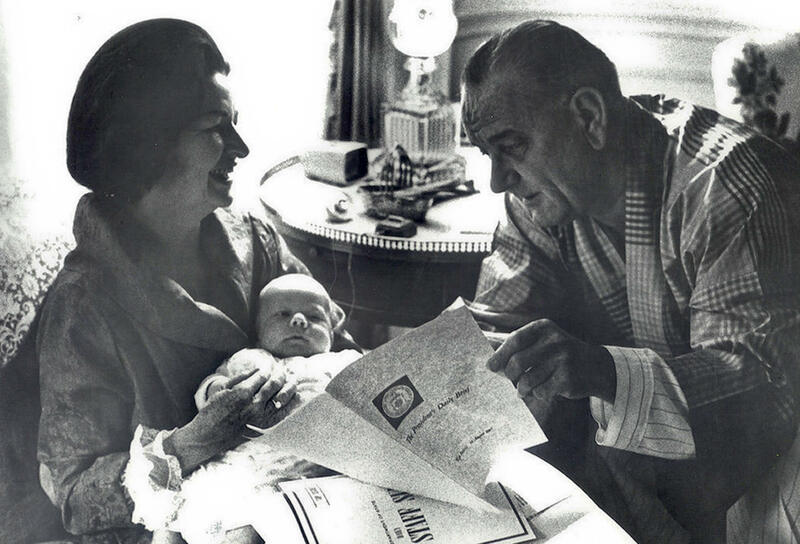 President Lyndon Johnson reads the President's Daily Briefing as his wife Lady Bird Johnson holds their first grandchild in the White House. As Morell concluded, Bush stepped into his waiting motorcade and headed to an elementary school. Moments later, news broke of the terror attacks in New York. Shortly after that, Bush and Morell were on Air Force One — and the president wanted answers. "The president said to me, 'Michael, who did this?' " Morell said. He didn't know but had a strong suspicion. "I told him that when we got to the end of the trail, I was absolutely confident, absolutely certain, that it would take us to [Osama] bin Laden and al-Qaida," said Morell, who retired in 2013 as the CIA's deputy director and now hosts the podcast Intelligence Matters. That landmark day captured both the critical importance — and the frustrating limits — of the President's Daily Briefing, or PDB. The practice of providing the president with a daily intelligence briefing began in 1946 with President Harry Truman, who was trying to make sense of a still-chaotic world in the aftermath of World War II. "He was troubled that he was receiving these random reports from different departments and no one was telling him, or suggesting to him, what was particularly more important than something else," said David Robarge, the CIA's chief historian. Truman created the Central Intelligence Group, the forerunner of the CIA. Within weeks, the briefings began, and they were brief indeed. Most were short notes from U.S. ambassadors with little or no context. Many reports were based on rumors or newspaper stories abroad and were difficult to verify, Robarge said. "We dealt a lot with information peddlers and fabricators and paper mills, as we called them," he said. "We were very desperate for information, and everybody knew that and took advantage of it. We spent a lot of our time in those early years sorting out the wheat from the chaff." Despite being a part of every president's daily routine for more than 70 years, the briefings are rarely discussed publicly. Just last month, the CIA declassified the first 20 briefings delivered to Truman — and many still resonate today. "The very first general item for Harry Truman was about some false information that was being put out about Russia and the United States," said David Priess, a former CIA officer. Priess was a member of the presidential briefing team in the early 2000s and wrote a history of the briefings called The President's Book of Secrets. Those initial briefings dealt with a trade dispute with China, which was resisting U.S. imports, and rising tensions on the Korean Peninsula, where war would break out a few years later. "Many of the issues that President Truman was dealing with in February 1946 are still on the agenda today," said Priess. Today's version took shape under President John F. Kennedy and was driven in part by the Bay of Pigs, the failed CIA operation to overthrow Cuba's leader Fidel Castro in 1961. "We knew John F. Kennedy was disappointed after the Bay of Pigs debacle early in his presidency and that helped spur this new intelligence product," Priess said. The documents began including more analysis on the pros and cons of potential U.S. actions abroad. While the CIA has always handled the report, other agencies now contribute, including the National Security Agency and the Office of the Director of National Intelligence. One misconception is that all presidents are briefed face to face. But, as Rodney Faraon, a former CIA briefer, said, "Every president receives their briefing differently." Most go over the briefing book on their own. For President Lyndon Johnson, it was bedtime reading. Richard Nixon didn't care for it and allowed only one White House adviser to see it — Henry Kissinger. Barack Obama received it on his iPad and had it circulated to more than 30 advisers. While Washington is sleeping, a team at CIA headquarters makes final edits to the leather-bound briefing book, updating it frequently. Rodney Faraon's job in the late 1990s and early 2000s was to study up on the document overnight and head to the home of his boss, CIA Director George Tenet, at 6 a.m.
"I would be briefing him in a secure vehicle on his way from his house to either the White House or to CIA headquarters," Faraon recalled. David Priess delivered his briefing to the director of the FBI, a man who was always pressing him for more details — Robert Mueller. Mueller now leads the investigation into Russian interference in the 2016 election and possible coordination with the Trump campaign. And Michael Morell remembers his briefings with Bush as if "I was in graduate school preparing to go in to seven or eight exams every morning with somebody who is going to fire questions at you nonstop." President Trump initially questioned the need for a daily briefing. But Mike Pompeo, the CIA director before becoming secretary of state, said it has become part of the president's routine. "Nearly every day, I get up, get ready, read the material that's been presented early in the morning and then trundle down [from CIA headquarters] to the White House," Pompeo said back in January. His successor as CIA director, Gina Haspel, is now a regular at the briefings, as is Dan Coats, the director of national intelligence. The intelligence community has had both great successes — like locating Osama bin Laden in Pakistan — and failures — like claiming Iraq's Saddam Hussein had weapons of mass destruction. The former CIA briefers say their role is to provide the best possible intelligence and leave the policy choices to the president. David Priess cites an old CIA expression: "You can lead policymakers to intelligence, but you can't make them think." Early on the day of September 11, 2001, President George W. Bush received his presidential daily briefing - an intelligence update. 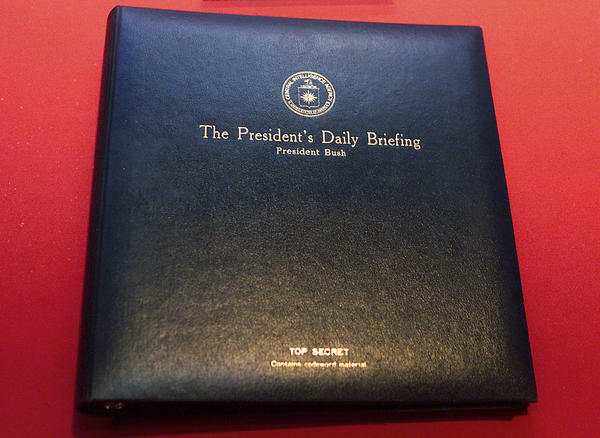 President Harry Truman was the first to ask for this daily briefing. Many presidents since would not start their day without it, although some, including President Trump, have questioned the need for it. Here's NPR's Greg Myre. GREG MYRE, BYLINE: On September 11, 2001, President George W. Bush was visiting Sarasota Florida. At 8 a.m. sharp, the CIA's Michael Morrell delivered an intelligence briefing, as he did six days a week when the president was at home or on the road. MICHAEL MORELL: Contrary to press reporting and myth, there was absolutely nothing in my briefing that had to do with terrorism that day. MYRE: As Morrell concluded, Bush stepped into his waiting motorcade and headed to an elementary school, and that's when news of the terror attacks broke. Soon, they were on Air Force One, and the president wanted answers. MORELL: And the president said to me, Michael, who did this? MYRE: Morell didn't know but shared his strong suspicion. MORELL: When we got to the end of the trail, I was absolutely confident, absolutely certain, that it would take us to bin Laden and al-Qaida. MYRE: Morrell is retired from the CIA and now hosts the podcast "Intelligence Matters." This landmark day captured both the critical importance and the frustrating limits of the president's daily briefing, the PDB. This practice of briefing the president every morning began with Harry Truman in 1946. David Robarge is the CIA's chief historian. DAVID ROBARGE: He was troubled that he was receiving these random reports from different departments and no one was telling him what was particularly more important than something else. MYRE: The first 20 briefings delivered to Truman were just declassified. Former CIA Officer David Priess, a member of the briefing team in the early 2000s, wrote a history of the briefings called "The President's Book Of Secrets." DAVID PRIESS: Many of the issues that President Truman was dealing with are still on the agenda today. PRIESS: The very first general item for Harry Truman was about some false information that was being put out about Russia and the United States. MYRE: The early briefings were brief indeed; most were short notes from U.S. ambassadors with little or no context. The modern version analyzes the potential pros and cons of U.S. actions abroad. It evolved under President John F. Kennedy, driven in part by the Bay of Pigs, the failed CIA operation to overthrow Cuba's Fidel Castro in 1961. Again, David Priess speaking via Skype. PRIESS: We knew that John F. Kennedy was disappointed after the Bay of Pigs debacle early in his presidency. That helped spur this new intelligence product for him. RODNEY FARAON: Every president receives their briefing differently. MYRE: For Lyndon Johnson, it was bedtime reading. Richard Nixon allowed just one adviser to see it - Henry Kissinger. Barack Obama took it on his iPad and shared it with more than 30 others. Rodney Faraon's job was to study up on the document as it was finalized overnight, then go to the home of his boss, CIA Director George Tenet, at 6 a.m.
FARAON: I would be briefing him in the secure vehicle on his way from his house to either the White House or to CIA headquarters. MYRE: It's a grueling job. Here's how Michael Morell recalls his briefings with Bush. MORELL: I thought I was in graduate school preparing to go in to seven or eight exams every morning with somebody who's going to fire questions at you nonstop. MYRE: President Trump initially questioned the need for a daily briefing, but Mike Pompeo, the CIA director before recently becoming secretary of state, says it's become part of the president's routine. Here's Pompeo in January. MIKE POMPEO: Nearly every day, I get up, get ready, read the material that's been presented early in the morning and then trundle down to the White House. MYRE: David Priess, the former briefer, cites an old CIA expression about briefing presidents and their advisers. PRIESS: You can lead policymakers to intelligence, but you can't make them think. MYRE: That, he says, is a timeless challenge. Greg Myre, NPR News, Washington. Transcript provided by NPR, Copyright NPR.